Wu Chun (吳尊) was heavily criticized for allowing his 3-year-old daughter, Nei Nei, to be filmed in a shower scene for the reality TV show, Dad is Back <爸爸回來了>. Yesterday, at a good friend’s hair salon opening with former Fahrenheit (飛輪海) members Calvin Chen (辰亦儒), and Jiro Wang (汪東城), Wu Chun was once again asked to comment on the controversial scene. He simply said he would be more cautious in the future. Although Aaron Yan (炎亞綸) was absent from the event, hundreds of fans trekked through the rain and surrounded the local mall in order to see Fahrenheit’s mini reunion. 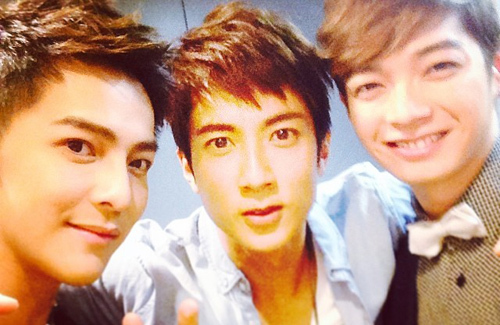 Although Aaron was missing from the event, Wu Chun said all the members remain very close to each other. Oh…Jiro’s had so much plastic surgery, he doesn’t even look the same anymore. totally agree. i told me friend that once and she thought i was crazy! he totally looks different! I thought he only did the nose? He still looks somewhat the same except for the nose. I also think he looks pretty much himself except for the nose. Back in the days, I thought they looked alike even before all of the surgery. I don’t find them looking alike before the surgery, but, they do kinda resemble each other after the surgery. But, not so much that I will mistake one for the other. Jiro still has his distinctive mouth and eyes. WHen I first saw Aaron, he looked like Wallace Chung to me. But he also looked like another person that I could not pinpoint at first. However, now I can see that he looked like Jiro to me. That’s just what I think though. Still have the sunshine smile. beautiful smile he’s got aye! lights up the entire room. Yea, Calvin has a bright smile and face. His face is natural too. and i am just thinking that i have seen them on movie films before???? I want to watch Calvin’s road-trip movie ‘3 Peas in a Pod’, but couldn’t find the DVD anywhere. Hope whichever company produced this film release the DVD soon.